I've been a little slack about blogging lately, mostly because I'm working like a fiend. Sadly, I haven't read much this week, but I did slip into the bookstore to pick up a book for my book club read and couldn't help but detour into the picture book section. Yes fellow readers, I am weak. 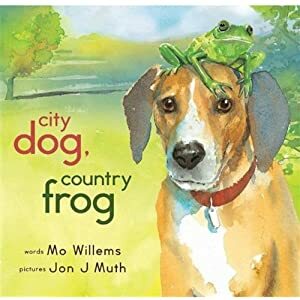 A new title that caught my eye was City Dog Country Frog by Mo Willems and Jon Muth. Willems usually illustrates his own stories, but this time he's listed as the author. I was intrigued. Muth's palate is much richer and more detailed than the one Willems works in, so I was had to peek to see how well the collaboration worked. Well, that was why I cracked the cover, but it didn't take long for this poignant, understated story about friendship and loss to draw me in. 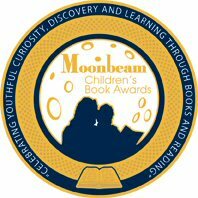 The premise is that, one spring city dog visits the country, runs free and meets a strange creature sitting on a rock; country frog. The two become fast friends and play country frog games like jumping and splashing and croaking. In the summer, city dog comes again, and this time they play city dog games like sniffing and fetching and barking. With the arrival of fall, frog is tired so the two friends rest and remember past pleasures. Winter brings the sadness of loss, which is exquisitely rendered by illustration alone. Spring brings renewal in the form of a new friendship, although it's clear that the lost one has not forgotten. Set against this backdrop of changing seasons, City Dog, Country Frog is a blend of the best of both words and pictures. I'm happy to report that this is one collaboration that I hope continues into other titles.